Droplet LP 5.0 is not simply a turntable, rather it is a 'system' consisting of turntable and stand, it is constructed from two slabs of polished pale marble separated by massive, triangular sections and supported by anodized-alloy columns - all tensioned by threaded rods running through the structure. The shape of the marble echo's the curves of the turntable, with the columns directly beneath the cones on the base of the turntable. The design is kept relatively simple, following well established 'best practices' - it is a conservative design. In essence it is a solid plinth design carrying a massive, tool-steel, inverted-bearing sleeve/shaft with a ceramic ball as the actual load bearing structure. 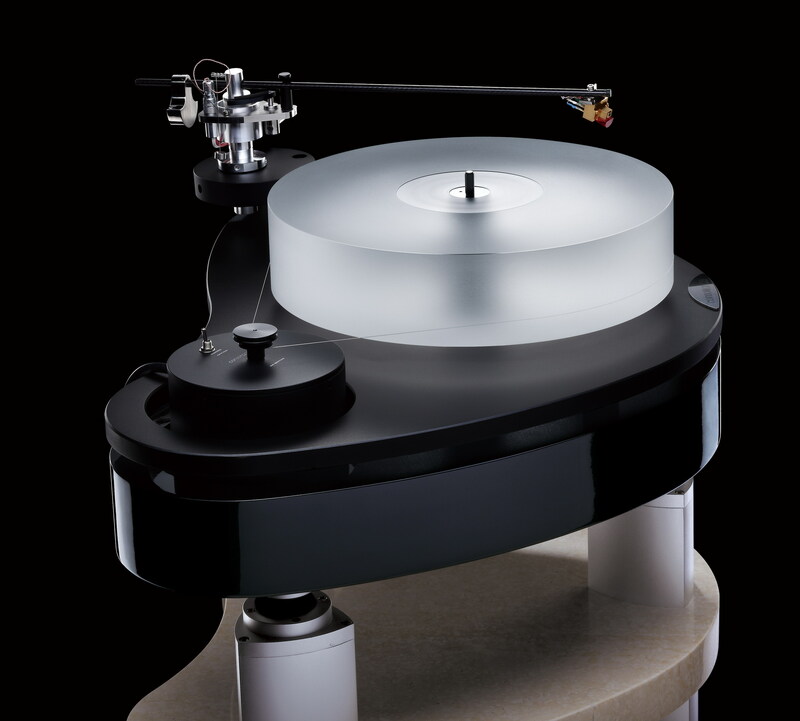 The German AC motor rests in a separate housing which then sits on a cork base within the wooden section of the plinth. Plinth: One piece machined anodized aluminum. Platter: Machined 67mm acrylic contoured to match record surface (indent for record label). Bearing: Large diameter inverted fixed spindle with polished ceramic ball on a teflon thrust plate. Motor: German manufactured precision hi torque AC motor with pully (33+45rpm). Speed control box: high precision speed controler PS-1.